Two years ago, I was lucky enough to be a part of a bold experiment inside one of Australia's big banks. 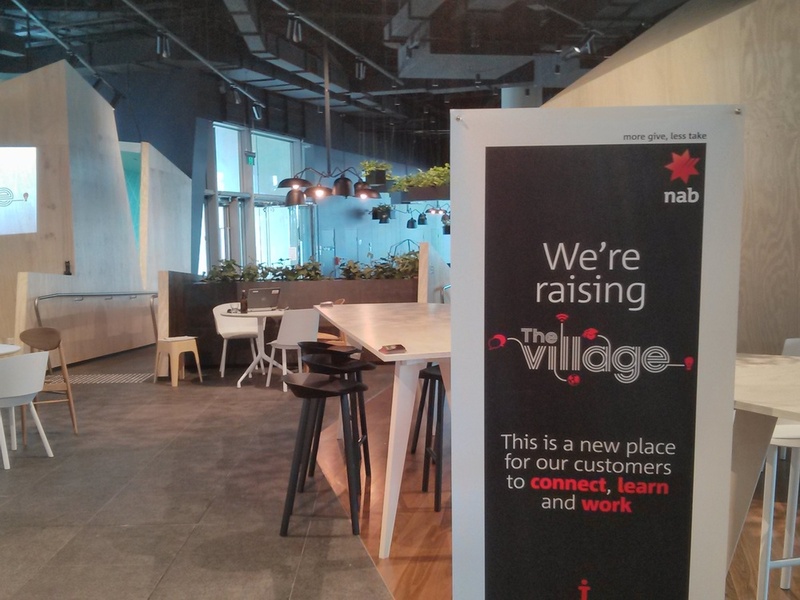 On the 25th November 2013, The Village at National Australia Bank opened to it's customers and the public in the new 700 Bourke Street building in Docklands. It was a step into the unknown for everyone involved, and I was feeling quite nervous. Nothing like this had been done before, and there was a lot of scepticism around that we could pull it off. Just how were we going to get people to want to come and work from a bank voluntarily? We committed to this challenge over a 12 month pilot with the hope that we could fill the space with people and life. What unfolded over the years is truly remarkable and something that I am still so proud to have been involved with. The first group of employees tour the space with the first Co-Host, Pam. Whilst it has now been 8 months since leaving The Village, I continue to stay connected, popping in when in Melbourne to say hi to all the Village people and hear how it continues to flourish. I've spend my time away reflecting on why it has been so successful, and thought I'd share some of the key focus areas, or experiments, that helped shape The Village into what it is today. It's a place that has yet to be explored. It's grey, unformed, and at times a bit uncomfortable. It's where the game-changers, the visionaries, and the rebels feel right at home challenging the status quo and shaping a new world. It's the place for the conversations that matter, to bring people together who care and want to create the future. If you were introduced to The Village in the year and a half that I was the Host, you may have heard something like this when you were given a tour. You see, whilst the original intent of The Village was to create a place for collaboration for customers, the vision that one that stuck in the minds of the 50,000 visitors in my time was that this was a somewhere where something different was happening. A place to imagine more, to inspire and be inspired, and I loved to see the spark in people's eyes as you could see them imagining the possibilities in this space, this community that we built. The Village was the edge of the organisation that hosted it, and saw itself as a positive disruptive force for the business world, financial services, and corporate Australia. It pushed boundaries between what it meant to be a customer, or an employee, or a business person, and we invited people to bring find their own edginess there. I always think that this is the place we feel most alive, have the most to lose (like our preconceptions of who we think we are), but also the most to gain. One of many 'edgy' events in The Village: this one was about how to bring kindness into the workplace. If only there were more spaces in the world where we were given such a powerful invitation. This invitation to "The Edge" was one experiment which went beyond my expectations. People responded so positively to it, because, I believe, we all want to believe that there is greatness in us. As a small business owner, we are passionate about the services we share with clients and the world, and surrounding ourselves with inspiration can help take ourselves to the next level. The Village holds a culture that fosters high performance because it supports people to take themselves beyond their own expectations, which often hold us back. I always wanted to work somewhere that made me feel like I can do anything. Over my time in The Village I witnessed people across many industries taking themselves further than they ever imagined, in sometimes the most simple ways, like running a workshop in a new area of thought leadership, attending networking events which felt scary, submitting proposals for clients that they felt was above them, joining non-profit boards or mentoring younger people. I watched hundreds of people grow and flourish through the community that supported and encouraged them. This is a community of leaders, in the truest sense; leading themselves, others through their work, and leading the conversations that the world needs. A few years ago, I was introduced to Open Space (sometimes called Open Space Technology or unconference) as an alternative to the meetings and conferences that many of us experience and frustrate us. It's based on the notion that the best part of events is often the networking and informal conversations that happen in the coffee breaks. That's where we have the real conversations; the ones we want to have that get us excited. For many of us, sitting and absorbing information just doesn't cut it. We want to have our say, build on knowledge, challenge, connect ideas, and inspire action. What I like about Open Space is that it trusts the process of self-organisation of people. As an Open Space event experience, the agenda of topics of conversation is set by the participants, and those individuals that are most passionate are asked to lead the discussion. I've been to a few Open Space events, and facilitated a couple too, and there is a beautiful moment when the host invited people to come to the centre of the circle to announce their topic… you could cut the anticipation in the air with a knife. The host holds that tension, and then, you always see people almost running in proudly, sometimes nervously, to stand for what they feel so strongly about. I love it! Everyone at the event is then empowered to go to the conversations that excite them and contribute in a way that they want. Everyone is responsible for their own involvement, which is embodied in the one law: the law of two feet, which states that if at any time you don't feel that you are learning or contributing, it's up to you and only you to go where elsewhere. There are lots of online support on running the event if you are interested, check some of it out here. Inspired by the engagement and passion of Open Space, I wondered, what could this look like on a day-to-day, week-to-week basis, where the principles are embedded into the culture or "the way we do things around here" in The Village. What practices could be adapted to our community to empower them to start and participate in conversations that matter to them? We started simply, with bringing people together informally for our Community Coffee, which we ritualised twice a week. It had no agenda, just an opportunity for the people who where in the space that day to get to know each other, share stories, challenges, and introduce their guests or team working with them that day. The first time we did it, I remember there was only a couple of us. But over time, it became an important part of The Village experience that continued to this day, often drawing 20 or more people together. It also became the one of the best ways to share what The Village was about for visitors and curious types, an informal induction for new members, and a powerful way for the bank employees to connect with their customers. After all, the best, most honest, conversations always happen over a cup of coffee. In any coworking community you come across, events play an important part of activating the space and bringing people together I was always impressed with the diversity of topics raised at Open Space events, and really felt that we could draw on the collective wisdom of our growing tribe. In the early days, we tried curating a calendar of events, setting up speakers, being 'strategic' with topics etc. It always felt a bit forced, and too much 'push', rather than 'pull'. There had to be a more natural, organic way for people to share their talents in a way that invited people to put their hands up and lead. This space, after all, was to be a place where people stepped up and were empowered, and the space was just the platform for those that cared enough to jump onto it. So, we invited our community to share what they were most passionate about, whether that be their business models and experiences, new ideas that were still being formed, their hobbies or secret obsessions. We were non-prescriptive around what it could be, as long as it added value to others and didn't push an agenda or product/service. What happened was remarkable. Within a short period of time, The Village went from hosting one or two events a week, to up to ten networking and learning events a week, with over 500 events in my time there. We became known for the range and diversity of topics and people, covering everything from the 101 of small business operations to yoga and meditation; self-development to robotic hackathons; senior entrepreneurship to gender diversity. If you wanted to start a conversations, this is where you could do it. 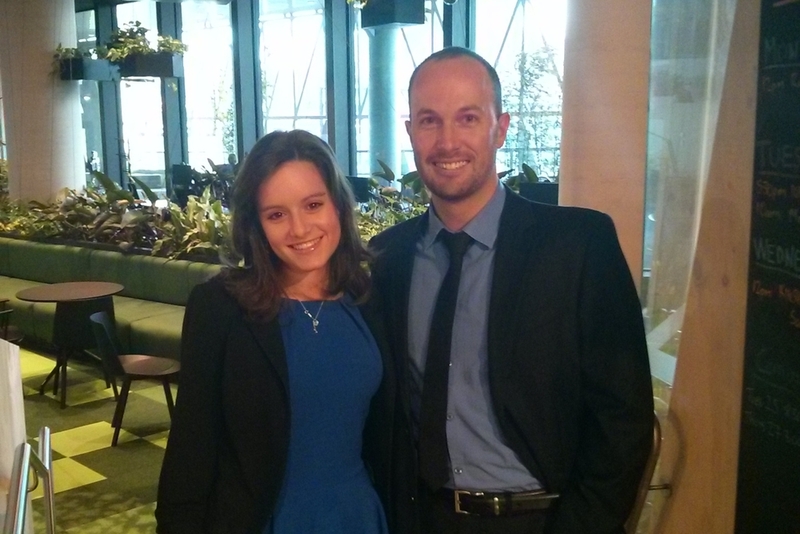 One of my favourite moments of event creation was with one of the members, Chris, who ran a start-up social enterprise. As we were writing up the events for that week in the noticeboard (another Open Space artefact), he was talking about how he felt we needed an event to help the start-ups in The Village to prepare and practice for pitching to potential corporate sponsors. We exchanged a glance, and came up straight up to take the chalk from my hand, writing up the event on the board. That moment perfectly represented just what Open Space is all about: that those who care lead the conversations that matter and invite others to participate. It was a very proud moment for me! Borrowing from a range of Open Space principles, we set up a culture of self-determinism, personal responsibility and continued learning and development, which I believe is quite unique for any workplace, and really models the way that we could work differently, drawing on the collective talents that often lie dormant in most workspaces and organisations. Customer service is one of those things that we all talk about, more often when it is poor or absent. Walk into many retail stores these days, and you're usually confronted with a staff member engaged on their phone, not looking up to acknowledge or to observe activity around. Call me old fashioned, but the days of good quality customer service seem to be behind us. The world of banking has also changed dramatically. Technology has automated many of the functions of the branch, removing the need to many of us to go in and line up to see a teller. During tours of The Village, I'd often ask people when was the last time they went into a bank, with many only once or twice a year. I'm definitely in that group! The opportunity with The Village was to give people a reason to want to come into a bank; reasons that were unexpected and surprising. More importantly, we wanted people to walk away with an experience that made them want to come back, and tell all of their friends and family. We wanted to give a world class customer experience. Ambitious? Well, yeah sure, but this was the place to experiment and imagine what the future of banking could be, so we set the bar high. I also had a hunch that if we created something that really delighted our customers, then they would help us to make it a success. In fact, their involvement and sense of ownership is what made it truly unique. One of the cool experiments we ran to build this ownership was co-creation sessions with our members, both physical and online. Under the guidance of Dr Catriona Wallace, CEO of Flamingo Ventures, entrepreneur and all round brilliant human being. We invited members to tell us what they wanted out of their experience in The Village, what they loved, and what should change. This was a very empowering experience for members, who went on to form a Village ambassadors group to continue to drive change and be a voice for members. You can read more about this experiment in Flamingo's case study on it . As the saying goes, you only have one chance to make a first impression, so we wanted that to be the best. Our Village hosts were the most important part of this, and the first person you would see on walking in. It starts with being acknowledged when you enter. Simple really, but how often do you enter a business and fail to get just a hi? All members and guests check in on digital displays, and this is when we check on with you. We are curious about you, who you are, what you are here for and looking forward to about the day. If you are a visitor, a guest, or just found yourself here drawn to the bright colours and greenery, we'll tell you a little about the place, and still get to know you. There were countless moments where people would just find themselves wandering down to The Village, and they would walk away after meeting us with a smile on their face and sense that they were welcomed there. For me, that is what The Village is all about. A place for every one to belong. ← Hosts of The Village over the last two years: Pam Voltscos, Jene-Lynn Klop, and current Hosts, Alex Gray and Marc Lim. I believed that every person who walks away from The Village needed to have a positive experience that make them want to tell their friends, family, colleagues, managers, the world etc. that something special is happening here. It doesn’t matter if they are Village members, their guests, NAB customers, other bank customers, general public, tourists, NAB employees, children, our elderly or another bank representative. What makes us stand out is a memorable and positive experience. The Village is a place where people leave feeling inspired and imagining more for their organisation and themselves in being a part of this community. I was one of those strange kids that would rearrange the furniture in my bedroom every few months. As I got older and moved into my own place, entire rooms and apartments would be transformed as shifting pieces of furniture changed the way the whole space felt. I've always remembered visiting friends saying "Wow, I like what you've done here". Funny thing is, is that they said that even when everything went back to a previous configuration. Living in London and managing a couple of restaurants was the first time I placed with public spaces. We used to experiment with all sorts of table arrangements, until we found one that really 'worked', and another, and another. In fact, each time we rearranged the place, revenue seemed to go up for a week or two. What was going on?? So naturally, we experimented with this in The Village also. The open "Village Square" is the first space you enter and are welcomed in. It is the part that frames your first experience when you are new to The Village, and sets you up for the day when you are a member returning. This space is really important. The tables and chairs and later, the Pride Tree, would shift over weeks or months, each time eliciting a "I like the feel of this space now" or "this works well". People like the feel of something new. Funny how this flies in the face of people convinced that somehow we all dislike change. One example of this, is the day the Pride Tree 'popped up' in The Village. Here is a wooden, bare tree in the middle of The Square, with no announcement, reason, instructions. Just a cheeky "I'm here". With some colourful leaves, deep questions and a few pens, over the next few weeks the tree came to life as Village members, visitors, children, NAB employees all engaged, laughed, reflected and shared their responses to questions like "What are you most proud of" and "What is your superpower". I loved to sit back and watch people explore it. Now, it is as much a part of The Village as the member blackboard, growing plants, and the welcoming hosts. It is unashamedly what The Village is all about. Surprising, playful, and a place to ask the important questions. I think that we are primed to recognise the changes and un-usual things around us, and this actually helps us to shift into a different, more agile mindset... which is the place where entrepreneurs and innovators thrive. We get bored and uninspired by stagnant surroundings, and need a sense of refresh and renewal to keep us on our toes and out of unhealthy patterns. When a change is noticable, like with pieces of furniture or even walls, we have a sense that we are exploring the terrain for the first time... adventurers and conquerers... and allow ourselves to find new places and ways of working and thinking. We can explore different sides of ourselves. The mission of The Village was to create an experience that inspired and helped people to imagine more for their business and themselves. Novelty played an important part of the element of surprise in their experience. 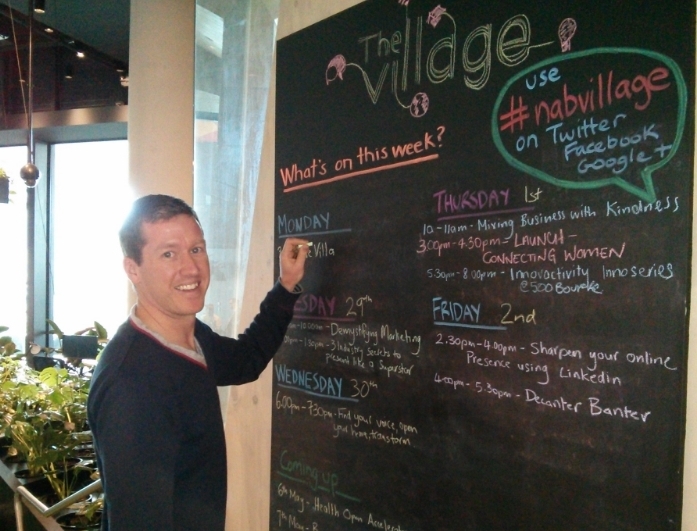 The Village is in itself unexpected, fun, cheeky, challenging, confronting for some, but welcoming for all. Everyone is able to explore maybe a part of themself for so long gone unacknowledged, which can only happen in a place where you are welcomed for all that you are and all you can imagine. For me, the novelty of inspiration is one that will never tire or wear thin.